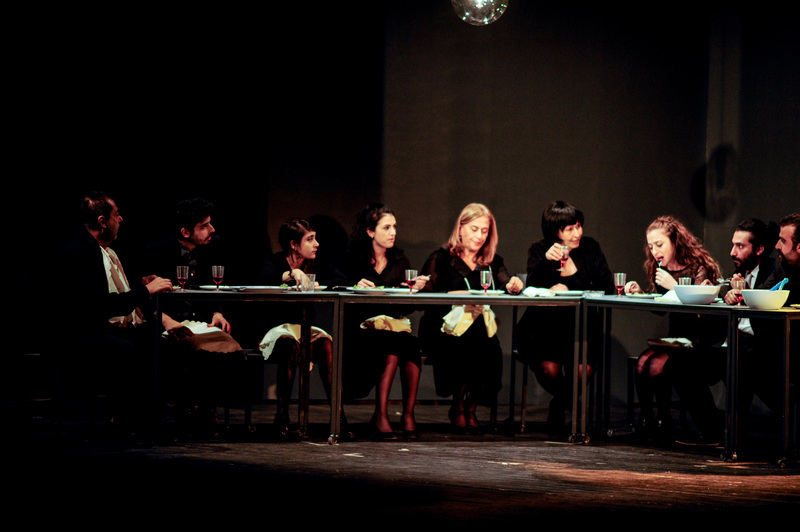 “AB Beit Byout” by Tahweel Ensemble Theatre. Photo courtesy of Alexy Frangieh. I must admit that I was skeptical when I heard about Tahweel Ensemble Theatre’s production in December of 2015 of Tracy Letts’s play August: Osage County. What, I asked myself, could a story about a Caucasian American family set in rural Oklahoma have to do with an Arab Lebanese family in Mount Lebanon? After seeing the production, I must admit that I was pleasantly surprised. Co-directors Sahar Assaf and Raffi Feghali, and their co-translator Muna Merhi, did not focus on the American particulars of Letts’ drama. Instead, they rightly made their play Ab: Beit Byout (Ab is the Arabic word for August, Beit Byout is a children’s game) about the timeless conflicts of a family in mourning. Assaf and her collaborators largely retain the original plot of the play, though they changed the titled, the names of the characters, the location of the play, and other details of the setting. For instance, as an homage to Letts’s play, the character Tamara lives and works in Oklahoma. The setting is an unspecified village outside of Beirut. The Native American helper in the original play has been translated to become a Kenyan woman named Kali (Aweel David), who is referred to by the other characters as a “Sri Lankiyi,” or “Sri Lankan,” the generally accepted term for a foreign domestic worker in Lebanon. Otherwise, the character relations remained the same, though the patriarch Beverly was entirely omitted. The title Beit Byout is a children’s game akin to “playing house,” which fittingly described the theatrical metaphor inherent to this production of the play. Performed in the basement Babel Theatre with a minimalist set design, the production clearly focused on the acting. The play was performed in one act with no intermission. The nondescript gray panels that served as the backdrop, minimalist metal furniture, and only the necessary hand props, everything on stage was meant to be purely functional. With the exception of one photograph hung upstage center, there was no set decoration whatsoever (which is unfortunate since the program presented the teasing idea that there would be family photographs that might be central to the design concept). The lighting was primarily for illumination, save a few specials that were meant to focus the action on particular actors in particular scenes. 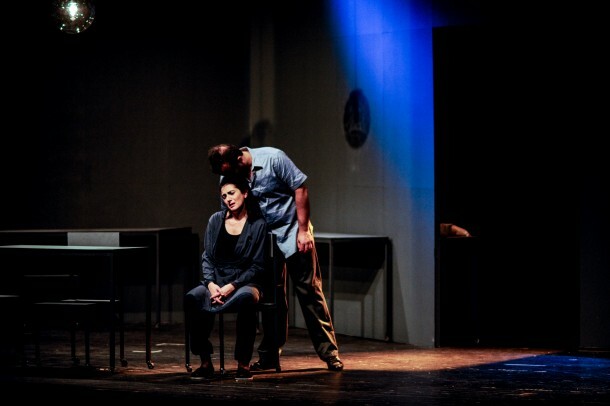 Sahar Assaf and Elie Youssef in “AB Beit Byout” by Tahweel Ensemble Theatre. Overall, the Tahweel Ensemble played very well together and the performances were generally solid. In a play with a cast of this size, it is difficult to cast actors that can uniformly play the style with equal technique and force. Nawal Kamel cut a striking figure with the opening monologue of the play, wearing a distinct turban covering her character’s hair loss due to chemotherapy. This matriarch was less scathing and vituperative than Meryl Streep’s version of Violet Weston; instead, Kamel gave the audience a woman who could be fiercely angry at times, and terribly vulnerable at others. She is obviously a skilled actress, and this role fit her perfectly. Sahar Assaf’s acting as Tamara was a tour de force performance. Assaf imbued the Barbara Fordham character with a steel-willed determination to take control of the filial situation, all the while struggling to mask the pain of her divorce from her husband Nouhad (played admirably by Elie Youssef) and the youthful rebellion of her young daughter Dana (a spirited Sarah Mashmoushi). Assaf found the perfect balance between Tamara’s vulnerability and her fortitude—the two aspects of the character that make her both loveable and detached. Farah Wardani’s Reem and Sany Abdul Baki’s Bahjat were a convincing pair doomed to love one another despite the knowledge of their incestuous past. Abdul Baki’s Bajhat was not the slow, almost mentally challenged character Benedict Cumberbatch portrayed in the film version of August: Osage County; instead, Abdul Baki’s character was a pathetic young man who never fully escaped his parents’ smothering oversight. Marcel Bouchakra’s Bahij and May Ogden-Smith’s Soukayna played their time-ravaged marriage convincingly, and it was apparent why Bahjat was so emotionally stunted given his family’s dysfunction. Raffi Feghali’s Karim was both charming and oleaginous, and Reham Sabeq expressed Bouchra’s powerful loneliness and desperation so convincingly that I fully believed that her character would remain with Karim despite his sexual advances on the teenage Dana. The play might have had more impact had certain scenes been executed with greater emotional force. For instance, when Kally discovers Karim trying to kiss Dana, both the sexuality of the advance and the subsequent violence of Kally’s broom attack would have benefited from a greater physical and emotional commitment from the actors. As it was, it seemed they were both playing at the scene rather than fully committing to the emotional stakes. The dinner scene (which was oddly staged stage right rather than stage center) also had great tension, but there too was a lack of viciousness and savagery in the dialogue. Finally, the minimalistic design did not convey much of the thematic content whatsoever. Had the design matched the level of the acting, this would have been an even greater production. Overall, Tahweel Ensemble’s production of Ab: Beit Byout was a success. This company created a strong, ensemble-driven work that fully captured the spirit of Letts’s drama while retaining the uniquely Lebanese character of the mise-en-scène. Performances by Assaf, Kamel, Ogden-Smith, Bouchakra, Feghali, and Abdul Baki lifted the caliber of the acting tremendously. In a time when dramatic theatre is sorely lacking in Lebanon, it is heartening to see a committed group of artists coming together as an ensemble to bring such drama to the stage. Now it is time for Lebanese playwrights to commit to writing contemporary dramas with the same sense of purpose. Instead of having to rely on translations of foreign plays, it would be great to see a company like Tahweel produce a Lebanese play by a Lebanese playwright focused on uniquely Lebanese issues—that would be a real triumph. Michael Malek Najjar is an assistant professor of theatre arts at the University of Oregon. He holds a PhD in Theatre and Performance Studies from UCLA, M.F.A. in Directing from York University (Toronto), B.A. in Theatre Arts from the University of New Mexico. He is an associate member of the Stage Directors and Choreographers Society (SDC), and an alumnus of the British/American Drama Academy (BADA), Lincoln Center Director’s Lab, Director’s Lab West, and RAWI Screenwriters’ Lab (Jordan). He directed the world premiere of Jamil Khoury’s Precious Stones and a staged reading of his own play Talib, both at the Silk Road Theatre Project, Chicago. He is the editor of Four Arab American Plays: Works by Leila Buck, Jamil Khoury, Yussef El Guindi, and Lameece Issaq & Jacob Kader and Arab American Drama, Film and Performance: A Critical Study, 1908 to the Present published by McFarland & Co., Inc. Publishers.